Next week the people of the UK will have to make a decision to stay in or leave the European Union. Everyday on the media, British voters are promised good things will result by our staying in the EU by the 'Remain' camp, yet we have been in the EU for forty years so where is this 'Social Europe' of worker's rights we have been promised? I conclude this very long experiment has failed. I wrote an article a couple of weeks ago* with reasons why we should leave. Here's a few more reasons. What Britain once accepted as a trade organisation has morphed into a political juggernaut which is undemocratic, corrupt and politically opaque and which has only advantaged the very rich, global corporations and Neo-liberal megalomaniacs. British voters have since been told if we Brexit WW III will start, there would be a £100 billion economic catastrophe, our foreign footballers and expats would all fall down, none of our scientists will be able to do any research, the NHS will go bankrupt, Scotland would leave the UK, the Spanish would seize Gibraltar and our pensions would collapse. And horror of horrors, the house prices of baby boomers will drop! And worse. We even had had two ex-Prime Ministers holding hands – as if they were in the same party (hmm…) telling us we must be good little people and vote 'Remain'. Soon we will be told that we can no longer see the Milky Way because of Brexit. As I write, my radio tells me that the polls declare the establishment side, the 'Remain' camp are losing, the 'Leave' camp are ahead by 10%. Really? I suggest the 'Remain' establishment and their friends are playing the same old trick. Dare I suggest a strategy has been put in place whereby spreading this fact across corporate print and broadcast media will surely render the leave camp complacent, and conversely make those in remain more fearful and more determined to register their vote and to use it. Don't I recognise here a trick that has been used on previous general elections, especially the last one – remember the Exit Polls – and even the Scottish referendum with great success. Don't be conned. Remember: YOU CAN CHECK OUT BUT YOU CAN NEVER LEAVE. The bigger the economic block the more thinly spread is democratic accountability. The more federal, the less power people have locally. Within the world's vast federations Is Athens going to become the EU's Detroit? Little people blame local governments, local governments pass the buck to central governments, central governments pass the buck the EU. British citizens, lend me your ears! Don't let them off the hook, don't let them to do that. The buck should stop at the House of Commons! And that's bad enough. Lots of lefty people say, vaguely, that they love Europe, that they feel European, and talk as though the EU is some sort of benign, almost charitable organisation. It is daft to confuse Europe (which is great) with the European Union. The EU organisation is a Goliath. To me it looks much like a building block, a limb of a future tyannical world government. Another question. Why has the European Union put up trade embargoes against the Russians? Aren't they cutting off their noses to spite their faces? Or more specifically the noses of millions of young people in Europe who need jobs? Doesn't this show just how politics and 'The New World Order' is more important than trade and the well being of their citizens to the EU? So it seems ironic that a country that went to war with us to claim their independence seeks to keep up in a block they helped to instigate. One cannot underestimate the profound influence the US holds within the EU. All future EU policies will have a stronger US subtext; policies which later issue forth from the commission. The European Commission: the most powerful body in Europe. Consists of 28 unelected people – one from each country – who meet in secret to decide on EU policies. No one takes minutes. Unlike our own democracy, the EU thrashes out the vast majority of its decisions in secretive committees that are closed to the public. No minutes are taken. And by the time a motion reaches the parliamentary chamber, it’s often a done deal. Britain has only 8.4% of the votes. US led NATO and the EU are both very much aware of which hand is doing what, and these hands have of late become very synchronised. The proposed EU military will have access to a great budget for purchasing armaments from the Military Industrial Complex in the future. Attempting to flatten Russia economically with these US dictated sanctions (following the hidden hands of the oil price crash) the EU successfully drove Russia into the hands of the Chinese and other trade markets. And I ask why, despite not being a member of the EU, does America have such soaring trade with the EU? Why is that allowed when it's not a member? And, disturbingly, after the referendum has gone, how quickly will the US influence seek to implement TTIP? isn't it about time for a British Declaration of Independence? On the radio recently a 'Remain' argument from the soft left was that we didn't want the right wing Tories in power in the UK. But the 'Leave' response was: At least you can vote them out after five years, whereas you can NEVER vote the bureacrats in Brussels out! If you are able to vote in this referendum, It's worth reading that last line again. 2 responses to Time for UK to declare their independence? 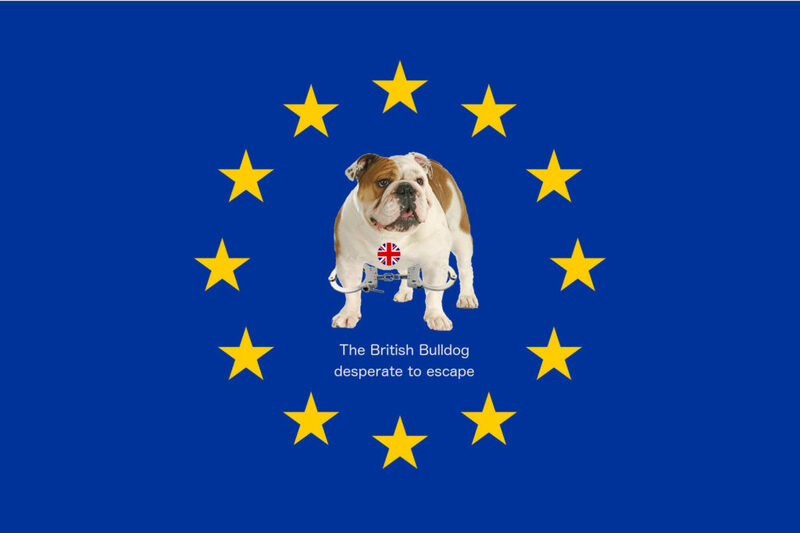 One cannot vote the authorities "out" in the EU, or Brussels, as you put it. Brussels is often mistakenly referred to as "the EU". The author here demonstrates a lack of knowledge of how the EU functions. No you cannot vote the authorities out in the EU, exactly my point.